When Anna Koval decides to creatively kill time at her library job in Austin by teaching herself HTML and posting partially fabricated stories about her life on the Internet, she hardly imagines anyone besides her friend Dale is going to read them. He’s been bugging her to start writing again since her breakup with Ian over a year ago. And so what if the “Anna K” persona in Anna’s online journal has a fabulous boyfriend named Ian? It’s not like the real Ian will ever find out about it. Almost instantly Anna K starts getting e-mail from adoring fans that read her daily postings religiously. One devotee, Tess, seems intent on becoming Anna K’s real-life best friend and another, a male admirer who goes by the name of “Ldobler,” sounds like he’d want to date Anna K if she didn’t already have a boyfriend. Meanwhile, the real Anna can’t help but wonder if her newfound fans like her or the alter ego she’s created. It’s only a matter of time before fact and fiction collide and force Anna to decide not only who she wants to be with, but who she wants to be. 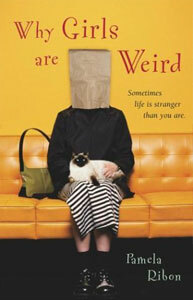 Why Girls Are Weird — novel. Pocket Books, currently in stores. Spent weeks on the San Francisco Chronicle Bestseller List. Optioned into a screenplay by the author for Robert Cort Productions, 2003. “Chick lit at its most trenchant and truthful.” — Jennifer Weiner, author of Good In Bed and Little Earthquakes. Buy Why Girls Are Weird in German!